Rogers Hornsby (left) and Ted Williams (right) are the only batters to have won the Triple Crown twice. Hornsby achieved this in 1922 and 1925, while Williams accomplished this in 1942 and 1947. The term "Triple Crown" is typically used when a player leads one league, such as the American League (AL) or the National League (NL), in the specified categories. A tie for a lead in any category, such as home runs, is sufficient to be considered the leader in that category. A "Major League Triple Crown" may be said to occur when a player leads all of Major League Baseball in all three categories. The term "Triple Crown" generally refers to the batting achievement. A batter who completes a season leading a league in batting average, home runs, and runs batted in (RBI) may be said to have won the "Triple Crown". As the term, unless modified, connotes the batting achievement, it may not be necessary to refer to this as the "batting" Triple Crown. The Triple Crown reflects the ability of a batter to excel in three important ways: to hit safely a high percentage of the time (batting average); to hit the ball long distances (home runs); and to produce when runners are on base, driving them home to score (RBI). It is an uncommon feat to lead all batters in each of these categories. It has been accomplished 17 times in a major league, most recently in 2012, by Miguel Cabrera. Cabrera's was the first since 1967, when Carl Yastrzemski accomplished the feat in back-to-back years with Frank Robinson, the only time this has occurred in baseball history. As such, this helps create enormous offense for a team throughout the season, to the point where the last four times a player won the Triple Crown, his team went to the World Series. In the major leagues, the most batting Triple Crowns won by a player is two. Rogers Hornsby was the first to accomplish it, winning his first in 1922 and then leading both major leagues in 1925 en route to his second Triple Crown, both with the St. Louis Cardinals. 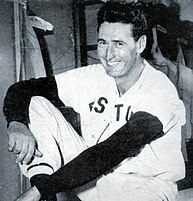 Ted Williams later matched this mark in the AL, winning in 1942 and 1947 with the Boston Red Sox. The Cardinals have won the most batting Triple Crowns as a franchise with four. Along with Hornsby's two, Tip O'Neill won in the now-defunct American Association in 1887 while the team was known as the St. Louis Browns, and Joe Medwick added the Cardinals' fourth in 1937. Eleven of the thirteen eligible players who have batting Triple Crowns have been elected to the Hall of Fame. Baseball writer and ESPN contributor Tim Kurkjian believes the Triple Crown has become more difficult to win with the advent of more hitters who choose to specialize in either hitting for batting average or power. Even more rare than the Triple Crown is the Quadruple Crown in which a Batter leads the league in the previously mentioned 3 categories of batting average, home runs, and runs batted in (RBI) over the same season as well as hits. Not officially recognized by the MLB, Carl Yazstremski achieved this feat during the 1967 season, hitting 189 hits, 44 home runs, and 121 RBI, with a batting average of .326. This was also notably done by Taiwanese player Wang Po-Jung when he led the Chinese Professional Baseball League or CPBL with a batting average of .407, 31 home runs, 101 RBIs, and 178 hits. Clayton Kershaw (left) and Justin Verlander (right) won the National and American League pitching triple crowns, respectively, in 2011. It was the first time since 1924 that both leagues had pitching triple crown winners. A pitcher who leads the league in wins, strikeouts, and earned run average (ERA) is said to have won the "Pitching Triple Crown". In contrast to the respective batting statistics, the Pitching Triple Crown statistics are more or less complementary of one another (for example, a pitcher who is especially proficient at striking out batters is likely to allow a relatively low number of earned runs, and consequently more likely to win games), therefore, the accomplishment is not quite as rare as the batting feat. In the major leagues, the Pitching Triple Crown has been accomplished 38 times. The most by one player is three, accomplished by three players. 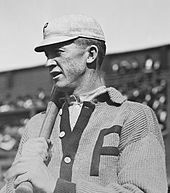 Grover Cleveland Alexander captured his first two in consecutive seasons with the Philadelphia Phillies (1915–1916), and won a third in 1920 with the Chicago Cubs. Alexander is the only major league pitcher to win a Pitching Triple Crown with more than one major league team. 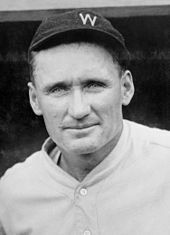 Walter Johnson won his three Triple Crowns with the first Washington Senators, leading the league in all three categories in 1913, 1918, and 1924. 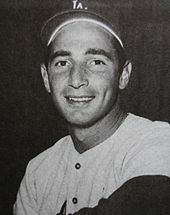 Sandy Koufax was the most recent to capture three Triple Crowns, winning his three within four seasons for the Los Angeles Dodgers (1963, 1965–1966); all of Koufax's crowns were Major League Crowns (led both leagues), the most for any player. Other major league pitchers who have won multiple Pitching Triple Crowns include Christy Mathewson (1905 and 1908 New York Giants), Lefty Grove (1930 and 1931 Philadelphia Athletics), Lefty Gomez (1934 and 1937 New York Yankees), and Roger Clemens (1997 and 1998 Toronto Blue Jays). One pitcher, Guy Hecker, won a Triple Crown in a major league that is currently defunct; he led the American Association in wins, strikeouts, and ERA in 1884 while pitching for the Louisville Colonels. Eighteen of twenty-four major league pitchers who have won a Triple Crown and are eligible for the Hall of Fame have been elected to the Hall of Fame. The Triple Crown winners who most recently became eligible for the Hall are Pedro Martínez and Randy Johnson. Both were elected to the Hall of Fame in 2015, each in their first year of eligibility. The most recent major league pitchers to achieve the feat are Clayton Kershaw and Justin Verlander, who won for the NL and AL, respectively, in 2011 (the first season since 1924 to see Triple Crown winners in both leagues). The first major league pitcher to achieve the Pitching Triple Crown was Tommy Bond, in the NL in 1877. 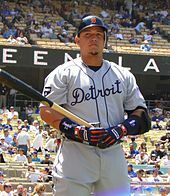 The following year, Paul Hines became the first major leaguer to lead the NL in the three batting categories; he and Miguel Cabrera are the only two players to hit for an AL or NL Triple Crown winners and not (yet) reach the Hall of Fame, although Cabrera is not yet eligible for election. The highest home run total reached by a Crown winner was Mickey Mantle, with 52 in 1956. The highest RBI total belongs to Lou Gehrig, with 165 in 1934. Rogers Hornsby has the highest home run total by a NL winner, 42, from his 1922 campaign. The NL high for RBI is 154, made by Joe Medwick in 1937. Hugh Duffy's .440 average in 1894 is the highest batting average by any player in NL history. Nap Lajoie, in 1901, set the all-time AL single-season high in batting average with .426. Among the major leaguers who earned the pitching Triple Crown, the lowest ERAs belong to Walter Johnson (1.14 in 1913 AL) and Grover Alexander (1.22 in 1915 NL). The highest win total belongs to Charles Radbourn, amassed in 1884, who in that year set a major league single-season record with at least 59 wins. Radbourn struck out 441 batters that season, the highest total for a Triple Crown winner. Walter Johnson holds the highest win total by an AL pitching Triple Crown winner, with 36, attained in 1913. Among AL pitching Triple Crown winners, Pedro Martínez registered the highest season strikeout total, with 313 in 1999. Since 1901, the major league pitcher with the highest season strikeout total in the course of a Triple Crown season is Sandy Koufax, punching out 382 in 1965. NOTE: Research in 2015 places the Chicago Cubs' Heinie Zimmerman of 1912 (back) on this list as well. There is doubt over whether Hugh Duffy's 1894 RBI totals were the highest. Miguel Cabrera is the most recent Triple Crown winner, achieving it in 2012; the first since 1967. Grover Cleveland Alexander won three National League pitching Triple Crowns (1915–1916, 1920) with two different teams. Hall of Famer Sandy Koufax won three National League pitching Triple Crowns, two consecutively and all three within four seasons. Walter Johnson won three American League pitching Triple Crowns with the Washington Senators. "MLB Triple Crown Winners". Baseball-Reference.com. Retrieved June 10, 2010. "MLB Baseball Hall of Fame Inductees". Baseball-Reference.com. Retrieved June 10, 2010. Gammons, Peter; Gillette, Gary; Palmer, Pete. The ESPN Baseball Encyclopedia, Fourth Edition (ESPN Baseball Encyclopedia). Sterling. ISBN 978-1-4027-4771-7. ^ a b Morosi, Jon Paul (June 4, 2010). "Cabrera has a legit shot at triple crown". Fox Sports. Retrieved June 11, 2010. ^ a b "1922 National League Batting Leaders". Baseball-Reference.com. Retrieved June 11, 2010. 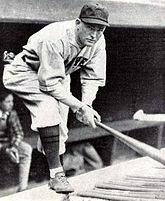 ^ a b "1925 Major League Baseball Batting Leaders". Baseball-Reference.com. Retrieved June 11, 2010. ^ a b "1942 American League Batting Leaders". Baseball-Reference.com. Retrieved June 11, 2010. ^ a b "1947 American League Batting Leaders". Baseball-Reference.com. Retrieved June 11, 2010. Frank Robinson is the only player to win a triple crown in each league. ^ a b "1887 American Association Batting Leaders". Baseball-Reference.com. Retrieved June 11, 2010. ^ "1937 National League Batting Leaders". Baseball-Reference.com. Retrieved June 11, 2010. ^ "Rules for Election". National Baseball Hall of Fame. Retrieved June 21, 2010. ^ a b "Hall of Fame Batting Register". Baseball-Reference.com. Retrieved June 11, 2010. ^ Nightengale, Bob (September 28, 2012). "Tigers' Miguel Cabrera closes in on rare Triple Crown". USA Today. Retrieved 28 September 2012. ^ Kurkjian, Tim (July 20, 2009). "Pujols pushing for Triple Crown history". ESPN.com. Retrieved June 10, 2010. ^ Rob (13 October 2017). "2017 CPBL Batting Quadruple Crown Winner Wang Po-Jung". CPBL STATS. ^ Connolly, Dan (July 9, 2007). "Cheers and jeers as Major League season hits midway point". The Post and Courier. Charleston, South Carolina. Retrieved June 11, 2010. ^ a b "1915 National League Pitching Leaders". Baseball-Reference.com. Retrieved June 11, 2010. ^ a b "1916 National League Pitching Leaders". Baseball-Reference.com. Retrieved June 11, 2010. ^ a b "1920 National League Pitching Leaders". Baseball-Reference.com. Retrieved June 11, 2010. ^ a b "1913 American League Pitching Leaders". Baseball-Reference.com. Retrieved June 11, 2010. ^ a b "1918 American League Pitching Leaders". Baseball-Reference.com. Retrieved June 11, 2010. ^ a b "1924 American League Pitching Leaders". Baseball-Reference.com. Retrieved June 11, 2010. ^ a b "1963 Major League Baseball Batting Leaders". Baseball-Reference.com. Retrieved June 11, 2010. ^ a b "1965 Major League Baseball Batting Leaders". Baseball-Reference.com. Retrieved June 11, 2010. ^ a b "1966 Major League Baseball Batting Leaders". Baseball-Reference.com. Retrieved June 11, 2010. ^ a b "MLB Triple Crown Winners". Baseball-Reference.com. Retrieved June 11, 2010. ^ a b "1884 American Association Pitching Leaders". Baseball-Reference.com. Retrieved June 11, 2010. ^ "Hall of Fame Pitching Register". Baseball-Reference.com. Retrieved January 14, 2016. ^ Kurkjian, Tim (January 9, 2012). "Whopper of a list of names await in 2013". ESPN.com. Retrieved October 3, 2012. ^ "Single-Season Leaders & Records for Wins". Baseball-Reference.com. Retrieved June 11, 2010. ^ cf. Macmillan Publishing Co. (1988). The Baseball Encyclopedia (7th ed.) (Joseph Reichler ed.). Collier Books. ISBN 0025790307. (crediting Radbourn with 60 wins in 1884). ^ "Krabbenhoft: Solving the mystery of Heinie Zimmerman's 1912 National League Triple Crown | Society for American Baseball Research". sabr.org. Retrieved 2017-06-30. ^ "Hugh Duffy | Society for American Baseball Research". sabr.org. Retrieved 2017-06-30. ^ "1878 National League Batting Leaders". Baseball-Reference.com. Retrieved June 9, 2010. ^ "Hugh Duffy Player Page". Baseball-Reference.com. Retrieved October 4, 2012. ^ "1901 American League Batting Leaders". Baseball-Reference.com. Retrieved June 9, 2010. ^ "1909 American League Batting Leaders". Baseball-Reference.com. Retrieved June 9, 2010. ^ "1909 Major League Baseball Batting Leaders". Baseball-Reference.com. Retrieved June 9, 2010. ^ "A Look At Baseball's Triple Crown winners". mlb.com. Retrieved April 7, 2019. ^ "1925 National League Batting Leaders". Baseball-Reference.com. Retrieved June 9, 2010. ^ "1933 American League Batting Leaders". Baseball-Reference.com. Retrieved June 9, 2010. ^ "1933 National League Batting Leaders". Baseball-Reference.com. Retrieved June 9, 2010. ^ "1934 American League Batting Leaders". Baseball-Reference.com. Retrieved June 9, 2010. ^ "1934 Major League Baseball Batting Leaders". Baseball-Reference.com. Retrieved June 9, 2010. ^ "1937 National League Batting Leaders". Baseball-Reference.com. Retrieved June 9, 2010. ^ "1942 Major League Baseball Batting Leaders". Baseball-Reference.com. Retrieved June 9, 2010. ^ "1956 American League Batting Leaders". Baseball-Reference.com. Retrieved June 9, 2010. ^ "1956 Major League Baseball Batting Leaders". Baseball-Reference.com. Retrieved June 9, 2010. ^ "1966 American League Batting Leaders". Baseball-Reference.com. Retrieved June 9, 2010. ^ "1967 American League Batting Leaders". Baseball-Reference.com. Retrieved June 9, 2010. ^ "2012 American League Batting Leaders". Baseball-Reference.com. Retrieved October 4, 2012. ^ "1877 National League Pitching Leaders". Baseball-Reference.com. Retrieved January 31, 2010. ^ "1884 National League Pitching Leaders". Baseball-Reference.com. Retrieved January 31, 2010. ^ "1888 National League Pitching Leaders". Baseball-Reference.com. Retrieved January 31, 2010. ^ "1889 National League Pitching Leaders". Baseball-Reference.com. Retrieved January 31, 2010. ^ "1894 National League Pitching Leaders". Baseball-Reference.com. Retrieved January 31, 2010. ^ "1901 American League Pitching Leaders". Baseball-Reference.com. Retrieved January 31, 2010. ^ "1905 National League Pitching Leaders". Baseball-Reference.com. Retrieved January 31, 2010. ^ "1905 American League Pitching Leaders". Baseball-Reference.com. Retrieved January 31, 2010. ^ "1908 National League Pitching Leaders". Baseball-Reference.com. Retrieved January 31, 2010. ^ "1913 Major League Baseball Pitching Leaders". Baseball-Reference.com. Retrieved January 31, 2010. ^ "1915 Major League Baseball Pitching Leaders". Baseball-Reference.com. Retrieved January 31, 2010. ^ "1918 Major League Baseball Pitching Leaders". Baseball-Reference.com. Retrieved January 31, 2010. ^ "1918 National League Pitching Leaders". Baseball-Reference.com. Retrieved January 31, 2010. ^ "1924 National League Pitching Leaders". Baseball-Reference.com. Retrieved January 31, 2010. ^ "1924 Major League Baseball Pitching Leaders". Baseball-Reference.com. Retrieved January 31, 2010. ^ "1930 American League Pitching Leaders". Baseball-Reference.com. Retrieved January 31, 2010. ^ "1930 Major League Baseball Pitching Leaders". Baseball-Reference.com. Retrieved January 31, 2010. ^ "1931 American League Pitching Leaders". Baseball-Reference.com. Retrieved January 31, 2010. ^ "1931 Major League Baseball Pitching Leaders". Baseball-Reference.com. Retrieved January 31, 2010. ^ "1934 American League Pitching Leaders". Baseball-Reference.com. Retrieved January 31, 2010. ^ "1937 American League Pitching Leaders". Baseball-Reference.com. Retrieved January 31, 2010. ^ "1939 National League Pitching Leaders". Baseball-Reference.com. Retrieved January 31, 2010. ^ "1940 American League Pitching Leaders". Baseball-Reference.com. Retrieved January 31, 2010. ^ "1945 American League Pitching Leaders". Baseball-Reference.com. Retrieved January 31, 2010. ^ "1945 Major League Baseball Pitching Leaders". Baseball-Reference.com. Retrieved January 31, 2010. ^ "1963 National League Pitching Leaders". Baseball-Reference.com. Retrieved January 31, 2010. ^ "1965 National League Pitching Leaders". Baseball-Reference.com. Retrieved January 31, 2010. ^ "1966 National League Pitching Leaders". Baseball-Reference.com. Retrieved January 31, 2010. ^ "1972 National League Pitching Leaders". Baseball-Reference.com. Retrieved January 31, 2010. ^ "1985 National League Pitching Leaders". Baseball-Reference.com. Retrieved January 31, 2010. ^ "1985 Major League Baseball Pitching Leaders". Baseball-Reference.com. Retrieved January 31, 2010. ^ "1997 American League Pitching Leaders". Baseball-Reference.com. Retrieved January 31, 2010. ^ "1998 American League Pitching Leaders". Baseball-Reference.com. Retrieved January 31, 2010. ^ "1999 American League Pitching Leaders". Baseball-Reference.com. Retrieved January 31, 2010. ^ "2002 National League Pitching Leaders". Baseball-Reference.com. Retrieved January 31, 2010. ^ "2006 American League Pitching Leaders". Baseball-Reference.com. Retrieved January 31, 2010. ^ "2006 Major League Baseball Pitching Leaders". Baseball-Reference.com. Retrieved January 31, 2010. ^ "2007 National League Pitching Leaders". Baseball-Reference.com. Retrieved January 31, 2010. ^ "2011 National League Pitching Leaders". Baseball-Reference.com. Retrieved September 27, 2011. ^ "2011 American League Pitching Leaders". Baseball-Reference.com. Retrieved September 27, 2011. ^ a b c d e f g h i j k l m n o p q r s t u v w x y z aa ab ac ad ae "Triple Crown - BR Bullpen". www.baseball-reference.com.